An overseas deployment is always an exciting adventure. Whether on board ship or assigned to a shore installation, days and weeks of hard work are interspersed with a chance to explore new countries or stop at various and varied ports. 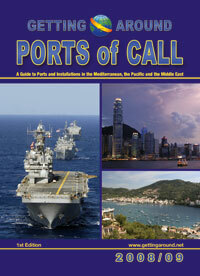 Getting Around in Ports of Call contains plenty of information of value to you during your deployment to Europe, the Middle East, the Pacific or Africa. This information is designed to make your overseas assignment and port calls as exciting and fun as possible. There's plenty of hard information that includes exchange rates, climate, time zones and emergency phone numbers. Also included is information about each country about where to go, what to see and how to get around. Not forgotten is information about the US installations, as well as information on dining out, shopping, tipping and greeting the citizens of the country where you are assigned or where you'll be visiting. And there are maps, tips and other information you should find helpful. The information here is as complete and accurate as possible. Some changes in exchange rates, facilities, services, telephone numbers and other areas may occur.